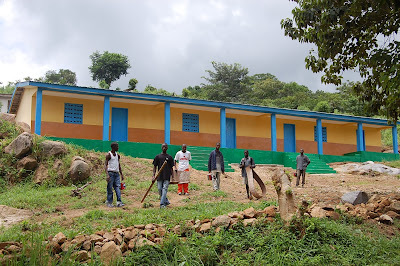 Work at the NHA Kabala School continues in a flurry to make the OPENING DAY deadline. Local Seamstresses are actively sewing, adding the NHA emblems and ironing the uniforms. 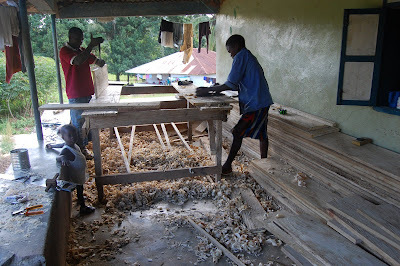 Area carpenters are creating Benches and Desks. 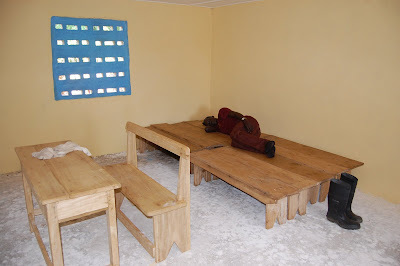 It is all hard work and makes for a long day...as evidenced by the totally worn out Pa Foday asleep on some freshly made benches in one of the classrooms. 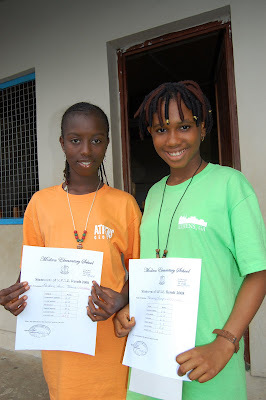 EVERYONE from USA to SIERRA LEONE is doing their part to bring this project to a reality. 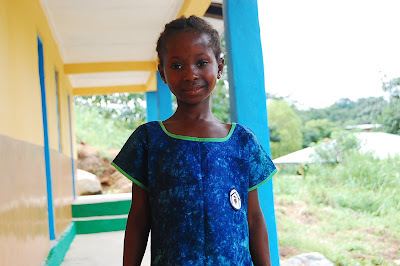 If you haven't contributed to this project, wont' you consider doing so TODAY? Tax Deductible donations should be sent to NHA, 2216 Goldsmith Lane, Louisville, KY 40218 or be made through the paypal link on our website. Thank you. 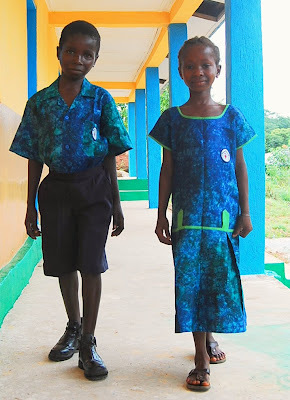 Next: Pa Foday, drained of energy takes a small rest on benches in classroom, Next: Lucy shows off a completed uniform. 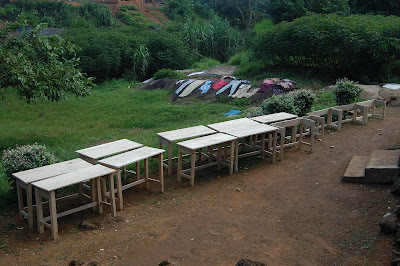 Bottom: Carpenters prepare desks and benches. 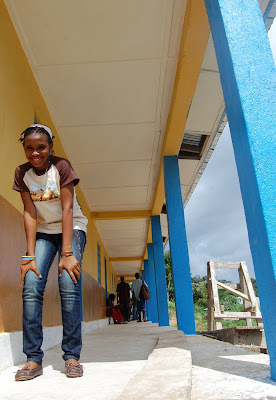 Greetings from Kabala. Mako says "Hello" and remembers with a warm heart all the prayers from you guys while he was so ill. 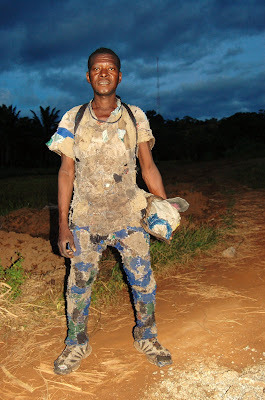 He is better now and has been volunteering his time working on the NHA Kabala School. 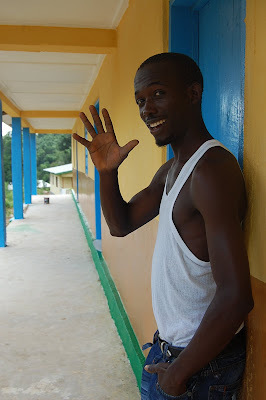 While in Kabala this weekend, James ran into this young man at the school sight. 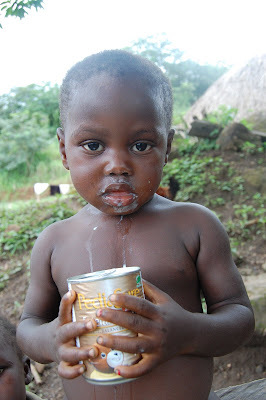 He was hungry and James happened to have brought a few cans of Pediasure (The Pediasure was sent to St. Laurence House from the Nazareth House Breeding, Kentucky Chapter) along. 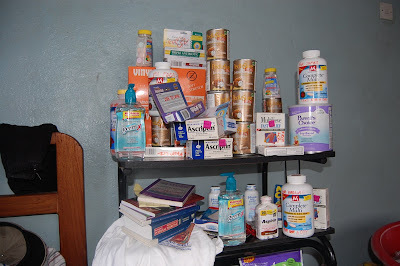 James finds it helpful for him during his recent ulcer difficulties. 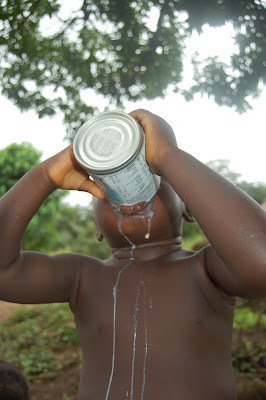 This starving little boy guzzled the Pediasure down in one gulp. He didn't stop to take a breath, just drank and drank. From the looks of his belly, he will be one of my candidates for the worm medication. Above are a few more photos from the previous post. 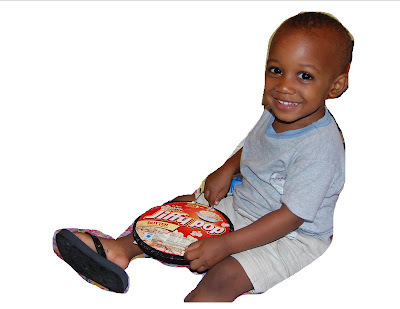 Some of you will notice the items that you sent into Nazareth House in Louisville. They have arrived in this shipment. More boxes are on the way and should be arriving any day now. 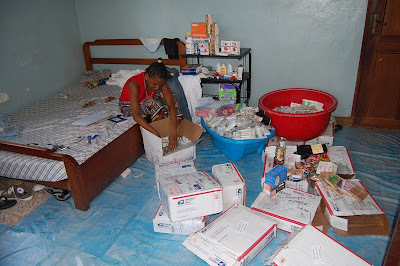 NHA is thankful for all the donations and very thankful to the Freetown Postal Workers for helping us to receive the much needed supplies for the Kabala Hospital and area needs. Thank you, thank you. 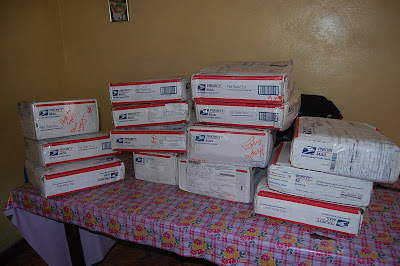 Once again the postal workers have come through for NHA and we have received a large shipment of postal packages. Many of these items were shipped months ago, but they did arrive and they came intact. This is fantastic. Lucy sorts and figures out the distribution. (I am happy to see that Lucy (our soon to be accountant - when schooling is complete -) is actively accounting for each piece that has arrived and categorizing and documenting. Wonderful! 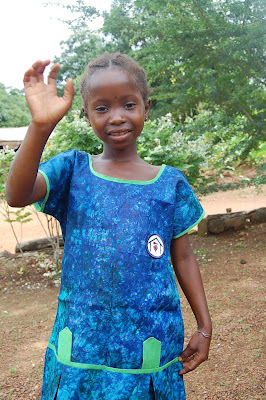 Thanks to your generous donations, we are coming closer to our goal for the mission needs in Sierra Leone. We are continuing to "sizzle" but still have not popped the goal. NHA continues to be in need of the "on the ground" money to make repairs, feed the hungry, give medical attention to those suffering. Our deadline is fast approaching. Let's work together to make complete this goal in a "jiffy". 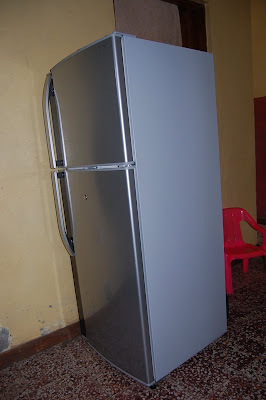 Thanks to your generosity, Nazareth House Apostolate Operations Center, affectionately known as St. Laurence House has received a new refrigerator to store medicines that must be kept cold (infant amoxicillin, etc). The above photos show the front and back of this cooler. In looking at the backside of the frig, I began to grin as I noticed it has been labeled. 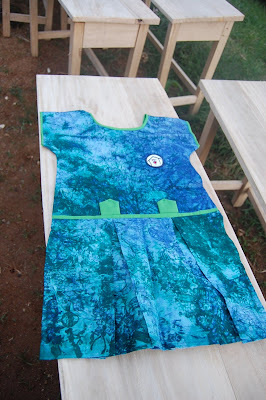 Labeling articles of clothing, items that we own - are standard process these days, especially when packing kids off to camp or school, lunch boxes, backpacks, etc. I can't remember ever labeling a refrigerator... its not an item that someone could easily become confused over its ownership. At least, I don't think so...but then I remember one Fall in Freetown when our neighbor came to us and informed us that "Thieves are presently at my house". We looked out the window only to see this man's mattresses being hurriedly carried down the street. So maybe someone could evoke ownership confusion over an item as large as a refrigerator. 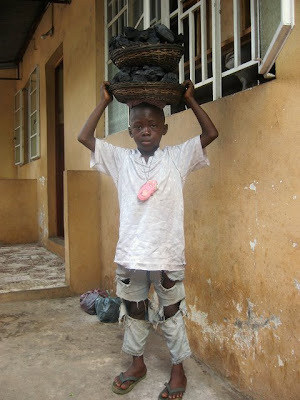 My first time in Sierra Leone, I did see a man carrying a refrigerator (only a bit smaller than the one in the above photo) on his head down a busy Freetown street. He had a small towel curled up on his head to help ease the weight. In preparation for our next mission to Sierra Leone we have begun shipping much needed supplies that are too heavy to pack. UPS goes into Sierra Leone, but only as far as the Lungi Airport which then requires either a helicopter flight, ferry or hovercraft to get to where you must pick up your package. Therefore, it is difficult and cost prohibitive to use UPS. 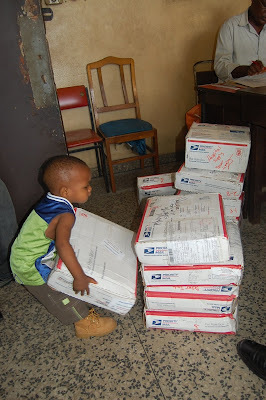 DHL is in Sierra Leone and delivers at doorstep...HOWEVER, they charge for the service...and they charge BIG TIME. Years ago, before we understood how to work the high costs of providing things to those in need. 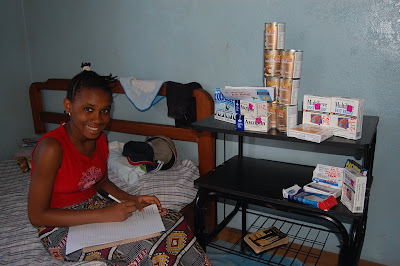 We sent a few cans of tuna, a pair of jeans and a jar of peanut butter to our staff in Sierra Leone via DHL. Our staff was hungry and there was no available protein (the war was not officially ended). We opened a credit account with DHL, shipped this tiny little box & next thing we knew we were receiving a bill of over $400 for the shipping and duty. 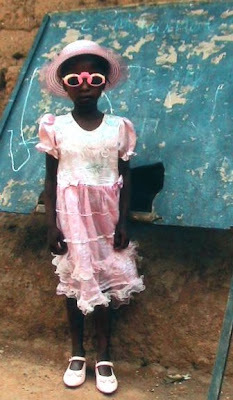 It didn't matter that it was a humanitarian aid gift. 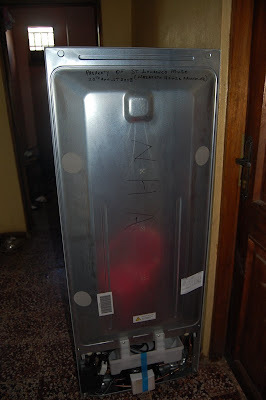 After much arguing on the phone, DHL did drop the charges but we never used them again. Instead, we use the USPS flat rate Priority boxes. We can cram up to 20 pounds into a box and it is never cost over $50. And we mostly use the $39 boxes which also allow 20 pounds. Recently, the Sierra Leone Post Office has been on strike due to non-payment of their wages. These workers go to work day after day and receive no pay! The only money they receive is the few tips they get from those collecting their mail. Today, James went to collect a few boxes that have been sitting at the Salone Post during the strike. 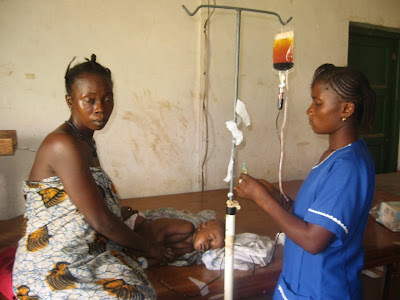 They contain medical needs for the sick. 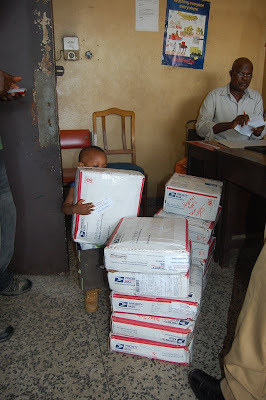 Hopefully, paid postal workers will be common practice, eventually, in Sierra Leone. I know they work hard to get the post to the people and the workers need to be paid. 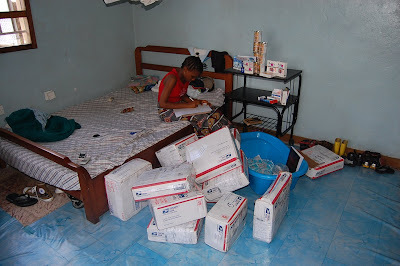 Nazareth House certainly appreciates that they diligently see that our supplies are received. 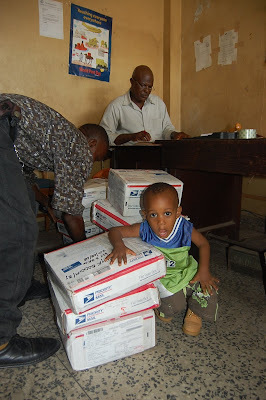 Thank you Freetown Postal Workers! 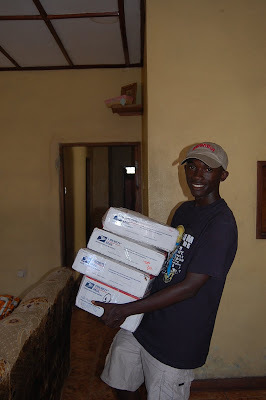 Nazareth House Apostolate received a shipment of o-t-c medicines for our Sierra Leone Mission via US Post on Monday from St. Charles Anglican Church, Huntsville, Alabama. Last week we received a bag full of o-t-c ulcer medications for James, as well as tums and vitamins from Donna A. in Louisville. Liz H. & Tom O. both of Louisville brought a good variety focusing on Diarrhea medication. 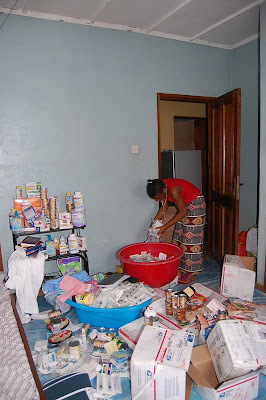 With what we have already shipped and what we have now packed to take, we are not doing too bad at all on our medication collection. Thanks for what has been collected and also for the donations which enable us to purchase specifically requested over the counter medicine. Here are the best eight in Lucy and Ann Marie's class. Bottom Photo: From left to right, Kinia, Matilda ( She took first scoring 360) Saio, Ann, kaday, lucy, saffie and josina. 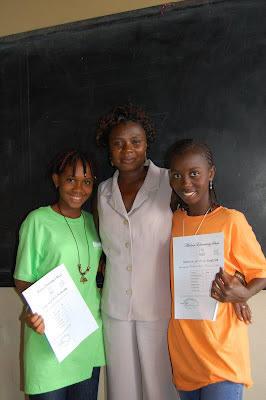 Top Photo: Highest Scoring Students of school with proud teacher! Lucy, Teacher, Ann Marie and Matilda. 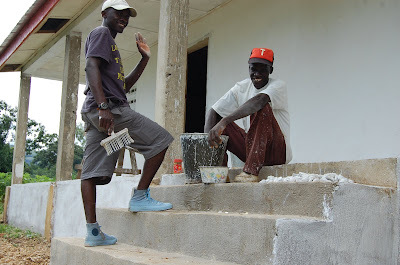 Last week, much to my concern, James, weakened from the ulcers, purchased lots of paint for the school building and took off for Kabala. 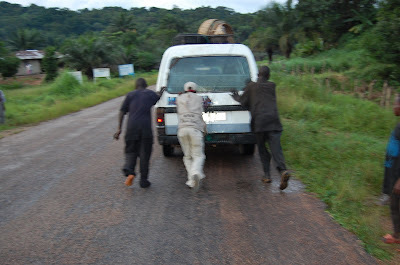 The journey to Kabala from Freetown is a long one. 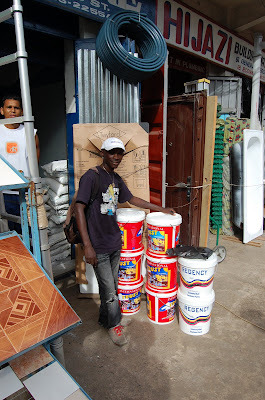 Traveling with many buckets of paint and other supplies makes the trip even more troublesome. 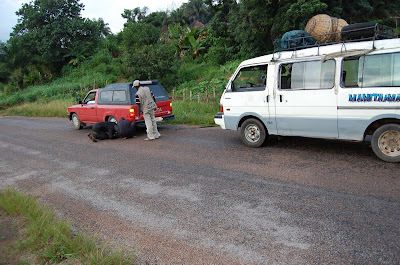 It seems to be the custom to have your vehicle break-down along the way and this particular trip was no exception. 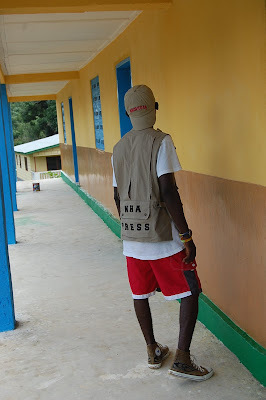 James has now returned safely to Freetown and photos on the latest work at the school will be uploaded to the blog periodically. 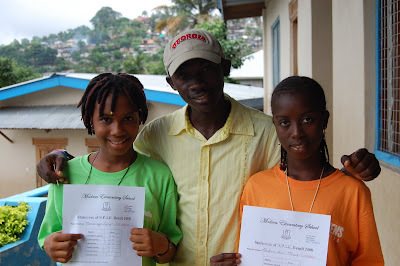 in Freetown, Sierra Leone is named. "treasures of the church", the poor. James and Kadijah named their little son in honor of this saint. 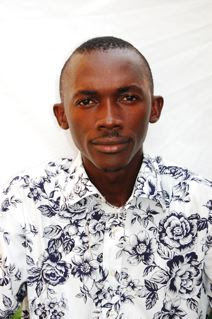 Although we all lovingly know him as "Roo", his full name is Laurence Thomas Mansaray. help to the poor and the needy. When a persecution broke out, Pope St. deacon?" he said. "I am not leaving you, my son," answered the Pope. 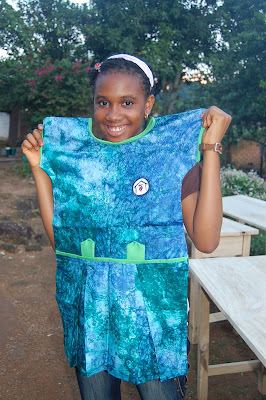 vessels to have more to give away. "This is the Church's treasure!" In great anger, the Prefect condemned Laurence to a slow, cruel death. gave him so much strength and joy that he even joked. "Turn me over,"
of Rome might be converted to Jesus. May you have a blessed St. Laurence Day and remember the poor and the hungry.